Cathy Chartrand skating for the Canadian Women’s Hockey League Montreal Stars franchise. In today’s game, a solid puck moving defender has become an integral part of any successful team whether it be men’s or women’s hockey. They allow their team to spend less time in their own zone and get the puck up for their forwards to attack the opposition. At one time, in the “dead puck” era of the National Hockey League, the dreaded neutral zone trap was king among coaches looking for success. Nowadays puck possession has become the key to a good defence. So the old saying of the best defence being a good offense has won out for now. In the NHL there are a multitude of statistics to choose from in determining who the best players are. From zone starts to CORSI/FENWICK and even things as simple as blocked shots. Unfortunately in the Canadian Women’s Hockey League these statistics are not available. So how do we know, aside from goals and assists, who are the best offensive defenders? Women’s Hockey Stats has adapted point shares to apply them to the CWHL. Point shares are a measure of how many points a player contributed by their offense and/or defense. For more information on point shares visit Hockey-Reference dot com. Chartrand was the best offensive defender in the league and has been at or near the top for some time now. Her 4.6 point shares equates to just over two wins in the standings contributed to the power house Montreal Stars. Without a doubt they were disappointed in failing to make the Clarkson Cup final this season. However with Chartrand returning they will once again no be lacking for offense from the blueline. Bolden was an essential player for the Blades and made a big impact on every game she played. Although her -1 rating indicates that she may still be gambling too much with her offense while sacrificing her defense. But with more experience she will be able to strike more of an overall balance to her game and challenge Chartrand for top spot next season. On a team with just 41% shots for per game, the best measure of puck possession, Danielle was able to contribute offensively and only post a -3 rating. 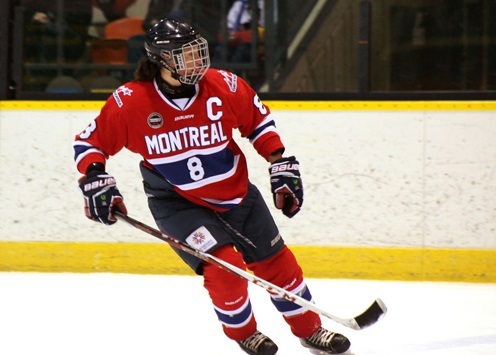 With more support next season Danielle will be noticed as one of the top defenders in the CWHL. One wonders how much better the Thunder would have fared with Nanji in the lineup for the complete season. Her numbers projected over 24 games would have been 9G 9A 18PTS. This would have brought Brampton closer to a potential spot in the Clarkson Cup tournament. Thunder General Manager Lori Dupuis is definitely hoping to have Nanji for a full season next year. When people think of the Blades they think of the big names like Hilary Knight, Meghan Duggan, Gigi Marvin, etc. However Burns was an integral part of Boston’s team this season and a big reason why they were able to get to the Clarkson Cup final. She played a very balanced game also contributing 1.3 defensive point shares. Players like Burns, while not heralded as much as others, are a must have commodity for a Clarkson Cup contender. With most of the top women’s hockey stars not participating in the CWHL this past season due to the 2014 Sochi Olympics, many new CWHL stars emerged. Players like Blake Bolden and Sasha Nanji will be looking to next season to continue to progress in their respective careers. For the Boston Blades Blake Bolden will surely be trying to help erase the memory of their overtime loss to the Toronto Furies in the 2014 Clarkson Cup Final. Regardless, the 2014-15 CWHL season is shaping up to be another exciting year and things will start heating up soon with the CWHL Draft on the horizon in August.